Travel is not bound by any month or weather for a true traveler. I too always try to grab any opportunity knocking and trying to get in #MeAndMySuitcase to go exploring. It was 2013 August, the month when monsoon is at its peak and an invitation to my friend's wedding in Kerala. That is when I thought of clubbing it with a visit to Bangalore at my cousin's. 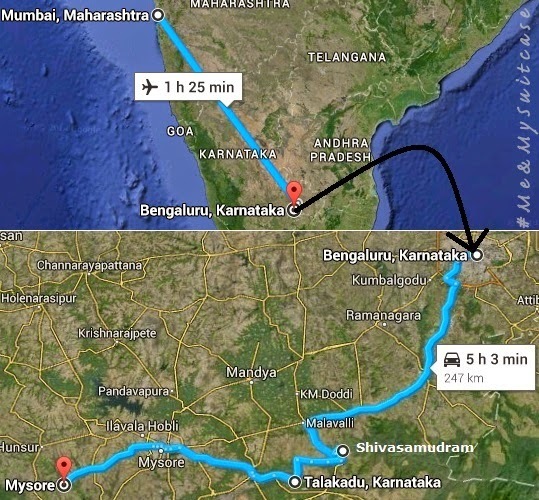 I broke my journey from Mumbai to Kerala at Bangalore for 2 days and explored the place and around. Me, bro and a friend, one car and a long road. We covered Bangalore - Shivasamudram Falls - Talakad - Mysore - Bangalore 'sector' in just 2 days. Shivasamudram falls is located in Mandya District and is the second biggest waterfall in India. Situated on the banks of Kaveri River, it is the location of one of the first electric Power stations in Asia, set up in the year 1902. The island town of Shivasamudra divides the river into twin waterfalls viz Gaganachukki and Bharachukki which are just a km apart. We started our journey from Bangalore to this beauty early in the morning at 06:30 hours. We took Kanakpura Road and the distance of Shivasamudram falls from Bangalore is 157.8 km via NH 209, i.e. around 3 hrs drive from Bangalore City. On the way had breakfast of south indian snack; idli, vada sambhar, chai etc. There are only a few eat outs on the way, so its better if you also carry snacks along and lots of water. We Reached Shivasamudram at 09:15 hrs and headed towards Gaganachukki 1st. Gaganachukki falls is 98m tall and is quite steep, obviously not allowed to climb down the rocks. Best viewed from the Shivasamudram watch tower and also from the site point. It is a beautiful fall and the noise is quite loud. Due to the force of water it feels like cloudy / foggy near the waterfall which is nothing but water only and actually not clouds. After spending sometime in Gaganachukki we left to visit its twin, Bharachukki falls which has a wider falling edge and its section looks like a "U", same as Niagara Falls. We spent quite sometime in Bharachukki Falls and yes touching its water is not prohibited. You can go boating in those beautiful round shaped cane boats like the one you might have seen in the movie Roja. You also need to maintain balance in the boat else be ready to swim. The aura of the place is truly heavenly and while boating you just can't think of anything else but just be mesmerized. You'll be taken very near to where water drops and yeah get ready to be l'il wet. You can bite on bhutta and cucumber their, enjoy the serene scenic view and click a lot of pictures in and around. Nonetheless the boat ride after some bargaining cost us Rs.50 per person. We spent around 2 hours in total at Shivasamudram falls and then left for the 2nd leg of our journey i.e. towards Talakad - The city of sand covered temples. On the way towards Talakad, we found a very old stone bridge on the right hand side and could not stop us from stopping by and clicking some more pictures. The bridge is resting on stone piers and if you notice carefully there is no hinge or connection as we see in the bridges today. Its commendable to see such construction from old age. Our journey continues to Talakad. Read here about our trip to the mystery city Talakad, the land of submerged temples and the many tales. 1. Shivasamudram is best visited from July to September. 2. Roads are good only when you reach near village area you will find some kachchi sadak. 3. Car hire charges - Rs. 7 to 15 depending on car. Ours was Indica AC (Rs.9 per km) + Rs.200 driver allowance + Rs.200 his night allowance. 4. Comfortable journey with clean and green surroundings. 5. Carry some food / snacks and lot of water along. 6. Don't try and go down the Gaganachukki falls it may prove fatal. 7. Don't feed monkeys which you will find in plenty specially in Bharachukki. 9. Take Care and have fun. We did. For any more info you can anytime contact me through the "contact form" on my blog. very nice complied.. all the info at one place for any new traveller..
Yeah! I was amazed myself. Do read about my next leg of journey as well which is about lesser known Talakad. Road trips are the best. You too a great decision by clubbing this with a wedding. I want to sit in that coracle boat. Looks like lot of fun.